O God, do not be silent! Do not be deaf. Do not be quiet, O God. “Come,” they say, “let us wipe out Israel as a nation. We will destroy the very memory of its existence.” Yes, this was their unanimous decision. Do to them as you did to the Midianites and as you did to Sisera and Jabin at the Kishon River. They were destroyed at Endor, and their decaying corpses fertilized the soil. O my God, scatter them like tumbleweed, like chaff before the wind! As a fire burns a forest and as a flame sets mountains ablaze, chase them with your fierce storm; terrify them with your tempest. Cover their faces with shame so that they will seek Your name Yahweh. Let them be put to shame and terrified forever; let them perish in disgrace. May they know that You alone — whose name is Yahweh — are the Most High over all the earth. Dr. David Reagan have great understanding of the complex endtimes. We see the ISIS movement. 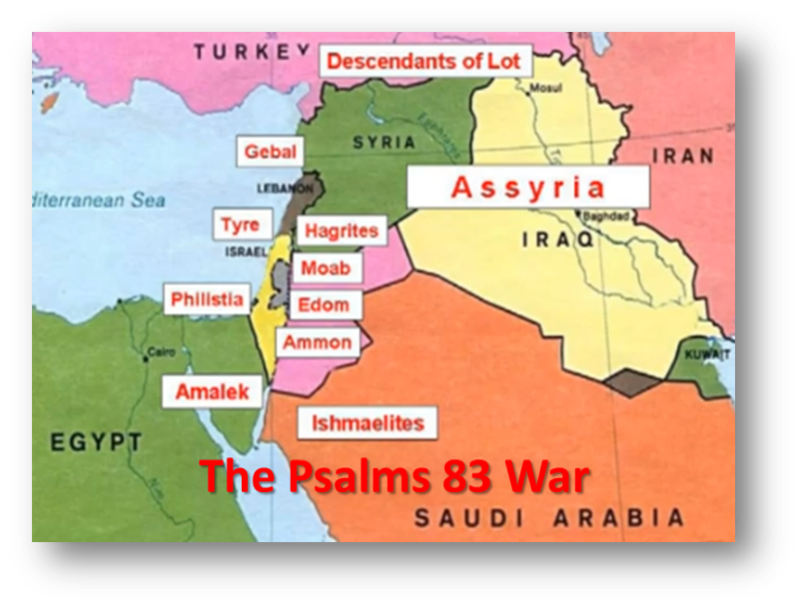 Psalm 83 war soon to come. Putin unites Shia and Sunni ! Pallywood and Hamas propaganda makes it possible. They cry out for help from the ISIS and other extreme groups fighting in Syria. Islamic websites in arabic language cry out for united jihad on Israel in this days. Isaiah 17 talks about Damascus and hard times. It will no longer be a city, only heap of ruins. People will no longer live there, royal power disappear from Damascus. ISIS terrorists are today not far from Damascus. ISIS, Hamas, Al Nusra and other JIHAD groups will finally be UNITED for an attack on Israel. Turkey is already supporting Hamas and ISIS. This attack is the Psalm 83 war. The GOG war will come to reality later, after my opinion. Maybe the Psalm 83 war will destroy the “Dome of The Rock” and prepare the way for the Third Temple? Who wants to build up a Third Temple? Not the Christians, but the Jewish Orthodox, the Freemasons and the Knights Templars. TO DO WHAT THEY ARE DOING. BUT AS YOU DISH OUT, YOU WILL REAP AND WHEN YOU WILL REAP BY DISGUSTING ACTS, MURDERS, MASS MURDERS, DEFRAUDING, BRINGING SUFFERINGS ON PEOPLE THAT ARE INNOCENTS, YOU KNOW YOUR REAPING WILL BE HORRENDOUS, AWFUL. BAD. IT WILL HURT. DONT THINK GOD IS TO BE MOCKED, HE VISITS ME TO BRING COMFORT FROM THE ABUSE BUT HE CLEARLY SHOWS WE SHOULD KEEP STRONG, KEEP OUR FAITH, TRUST HIM. AND HE DOES NOT AFFECT YOU NEGATIVELY. HE ALWAYS USES PEOPLE AND THEN SNATCHES THEM IN HIS NET AND DESTROYS THEM. WE CHOOSE WHO WE FOLLOW AND OUR CHOICES HAVE THEIR CONSEQUENCES. SO YOU KNOW WORLD THAT THEY WILL GET IT IN MANY WAYS. IS TO BE WITH GOD AND TO GO ON THE OTHER SIDE IS TO BE WITH GOD. SO THINK ABOUT IT……………HOW STUPID, DUMB ARE THEY? MEN IF WE UNITE WE CAN FULLY DEMAND THEY ARE GIVEN THE GUILLOTINE AND EVEN THAT IS TOO GOOD FOR THEM BECAUSE WHEN GOD ALMIGHTY, THE WARRIOR OF warriors STARTS TO WAR………..
WAKE UP PEOPLE, WE ARE HIS ARMIES AND WE HAVE HIS ZILLIONS OF ANGELS FIGHTING FOR US. WE ARE NOT LEFT HOPELESS. SO WHO IS AFRAID OF THE GARBAGE???? This entry was posted on 01/08/2014 by Skriveren in Politics, prophecy and tagged Gaza, israel, jews, middle east, Palestine.